Ocean Alexander has posted a video showing the OA90 yacht arriving in Florida for her worldwide debut. 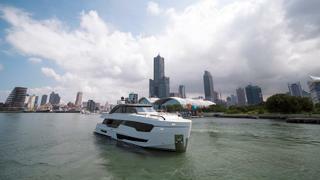 The yacht, which was shipped from Taiwan, will be presented at the Fort Lauderdale International Boat Show next week. It comes after the 27 metre yacht was filmed undertaking sea trials in August. 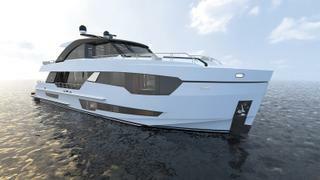 The OA90, which is the product of a collaboration between Evan K Marshall and the yard, features an almost vertical prow and extensive glazing across three decks. Marshall admitted the yacht provided his design office with “one of our most exciting and rewarding challenges to date,” resulting in a yacht populated with standout design features. These include guests arriving on board via a large swimming platform and glass fronted superyacht beach club, which is accessed via sliding curved doors. Marshall describes this area as a “destination space”. Up one level and the shaded cockpit offers an ideal spot for enjoying a light meal or a cocktail. Moving inside, the OA90 boasts a highly sociable layout, with a drop-down television that folds down from the ceiling. The main dining area will seat up to six guests, while sliding wall panels allow for the galley to be concealed when needed. A full-beam master suite is situated forward, offering stunning views out to sea through floor-to-ceiling windows, while the lower deck offers a VIP cabin and two twin cabins taking the total accommodation to eight guests with the potential to upgrade to ten. The design is capped off by an open-plan skylounge, with the superyacht wheelhouse blending seamlessly into the upper saloon and bar area. Al fresco relaxation options include a split foredeck seating area with sunpads and a dinette, while the upper deck aft offers another bar area and two L-shaped settees.